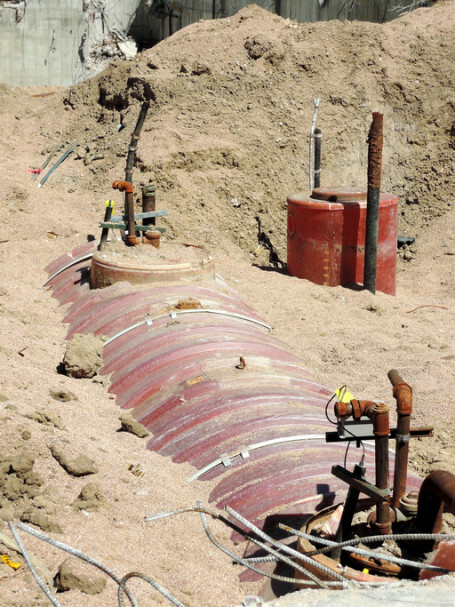 Today we’d like to highlight another area of expertise that doesn’t often get very much fanfare, but it’s still really important – Underground Storage Tanks (USTs). There are over half a million USTs in the US right now, all of which store potentially hazardous substances. USTs are really essential because they’re used to store a variety of products, including ones that are petroleum based, by numerous agencies and industries. Some of the products may include gasoline, kerosene, heating oil, jet fuel, diesel, hydraulic oil, propane, used oil, and more. USTs are federally and state regulated, so they must be properly installed by licensed and certified contractors. USTs are heavily regulated because if the hazardous substances they contain leak out, ground water could be seriously contaminated. As we previously mentioned, the chief concern with USTs is making sure the hazardous materials they contain don’t contaminate ground water. Owners and operators must follow regulations to protect USTs from corrosion, overfills, spills, and more. Anytime a leak is discovered, the UST must be cleaned up and the groundwater must be effectively restored and protected. If you own and/or operate a UST, you probably don’t want to get certified as a licensed UST contractor. Instead, simply partner with H2 Environmental Consulting Services for all your UST needs. We can manage your UST system, plus we can test, monitor, and eventually excavate and remove your UST when the time comes. We have been specializing in UST management for over 24 years, so your UST is definitely in good hands with our experts. We follow all regulations to the letter and use state of the art equipment to fulfill all your UST needs perfectly, every day. Establish your partnership with H2 Environmental Consulting Services by calling (800) 524-3578 today. H2 Environmental Consulting Services is the best company to call for all your environmental needs. We’re always ready and willing to use our state of the art equipment to test your property for hazardous materials. Plus we provide complete remediation services that follow all federal and state regulations. We also offer complete environmental management services, including training of your staff. Don’t hesitate to enlist the expertise of H2 Environmental Consulting Services for all your environmental testing, consulting, remediation, and management needs.